Lake Titicaca is the world’s highest navigable lake, which makes it a winner in our books, and that’s before you even explore the floating Uros Islands. These islands are made entirely from totora, an indigenous reed that grows in the lake's shallows and which has been used to create these extraordinary man-made islands and the boats the inhabitants use to navigate around the lake. Spend time with the charming locals and a guide who can explain their traditional way of life and customs. Next stop is the island of Taquile, a more traditional (ie: static) island where the local Quechua people's traditions continue in much the same way they have for centuries. The locals, or Taquilenos, are expert weavers as well as exceptional hosts, and we defy you to come away without having bought some of their brightly coloured clothing. 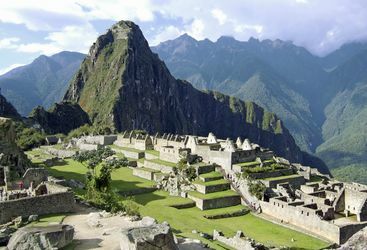 The island has additional appeal in the form of Incan terraces that are still in use today for crops as well as wild flower meadows. The final island stop is Amantani, home to beautiful cantata flowers and a place of pilgrimage and worship since pre-Columbian times. Today Andean priests known as Pacos still perform ceremonies at the Pachamama and Pachatata sanctuaries, maling offerings to the earth and the sacred lake. Ollie and Kate B are our 'Tour of the islands on Lake Titicaca' experts and as seasoned travellers they have the inside track on the most memorable adventures.